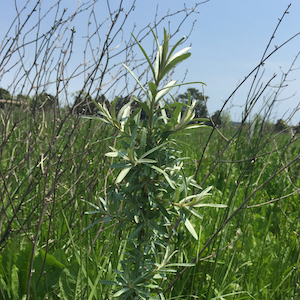 There is more to this farm than sea buckthorn, though. She has planted 250 Chinese chestnut trees and 250 native persimmons onto which she has grafted Japanese persimmons. There are goumi shrubs and elderberries. The goumi produce red berries with silver spots which can be eaten as a fruit or used as a botanical in future skin care products as they contain vitamins, flavonoids, and other bio-active compounds. Elderberry is also full of minerals and vitamins, particularly vitamin B17. The flowers can be used for tea, and the berries can be mashed for juice or used as a tonic for colds and flu. Elderberry is the source of the natural preservative used in the Celluvati products. After walking through the fields and talking with Catherine, it became clear that this is yet a different type of farm. Her focus on healing and bio-active plants, shrubs, and trees will provide the raw materials she needs for her skin care products. Like the folks at La Caridad Farm, she does not use chemical fertilizers and she is seeking to build her soil by allowing a multitude of plants to compete with those she has planted. She is working to achieve a diversity of plants and an interwoven ecosystem. Her long-term goal is to have the farm support her so that she can retire from her job as a scientist with the Air Force Research Laboratory in Washington, DC. I’ve described the mad scientist half of her activities, but what about the business executive part? She is a woman with a plan and her plan is only executed if the business plan she develops proves it will be successful. 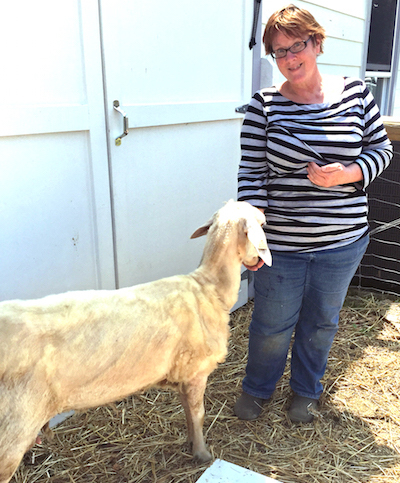 Although most of her “crops” are perennials and require very little hands-on effort, this spring she purchased seven sheep for a very different venture. She intends to make small-batch ice cream in exotic flavors to sell in one cup containers. She has two types of sheep: Awassi and Assaf. Samson and Delilah, the two Awassi, came to the United States from Australia as embryos and were born to East Freesian ewes. Delilah gave birth to a lamb on the farm called Emma. Five Assaf sheep are females and will be used to broaden the genetics of the herd. 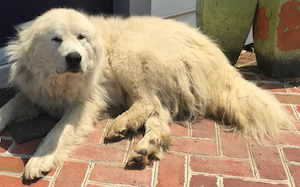 A Great Pyrenees mixed breed dog came along with the sheep to provide protection from coyotes. Sam was raised with the sheep and is a bit skittish around people. Catherine chose sheep over goats and cows for her dairy venture because sheep’s milk is the highest in fat and produces a richer milk. She is in the process of setting up her milking barn complete with a 30-gallon pasteurizer and two 4-gallon pasteurizers. When her barn and certification is complete she will be categorized as a Grade B dairy which means that her milk is to be used in manufactured dairy products like ice cream. She has been testing ice cream recipes and I was fortunate enough to be on the receiving end of a few spoonfuls of her ginger lemon balm ice cream. It was very high fat with a subtle lemony flavor interspersed with small candied ginger nuggets. Yum. Look for her ice cream this summer at the Onancock Farmers Market. Catherine’s family has been on this piece of land just east of Quinby on the Machipongo River since 1666. The house, shown below, dates to the 18th century. Undoubtedly, her forebears planted cash crops in straight rows which were harvested and taken to the farm wharf where great ships transported them to cities up and down the Atlantic and Chesapeake coast. Today’s ecology and economy is different and Catherine has successfully adapted this centuries old farm to new uses and new agricultural methods.